Sponsor one of our cat or dog cabins today and help Mayhew continue to rescue and rehome animals. 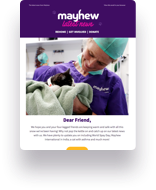 Every year, Mayhew helps hundreds of cats and dogs in need at our animal home in London. We can support up to 30 dogs and 150 cats at one time, but receive no government funding. We can only help these animals with your generous support. It's people like you who allow us to open our doors every day. You will receive your sponsorship pack approximately two weeks after setting up your sponsorship. If you have any particular requirements or would like to arrange for the sponsorship pack to be sent earlier, please contact us by phone on 020 8206 5870. If sponsorship isn't for you, we have plenty of other ways to support our animals. From one-off donations to challenge fundraising, you can help cats and dogs in need. If you would like more information or need help setting up your sponsorship over the phone, please get in touch.